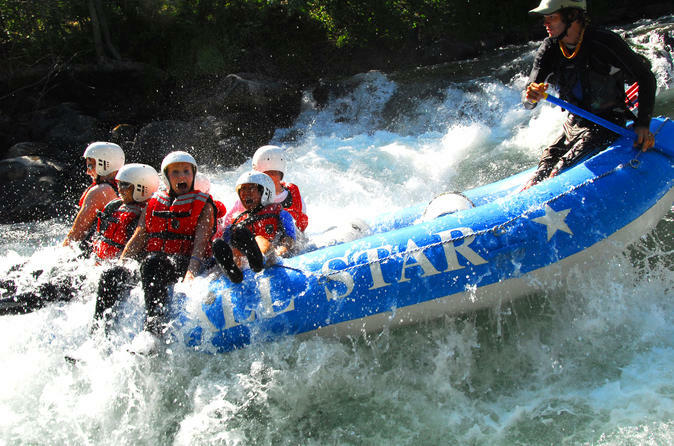 The best whitewater rafting near Portland, Oregon! This classic stretch of the White Salmon River, from the put-in at BZ corner to the takeout at Northwest Park is a perfect trip for adventurous beginners and tested veterans alike. Professional river guides will help you navigate the class three and four rapids such as Husum Falls, Rattlesnake, and Maytag. The price of the tour also includes all of the gear you need, from wetsuits to life jackets and paddles, as well as basic training in staying safe on the water. Guests will meet at the takeout of the river, located at Northwestern park, near White Salmon, Washington, about 1.25 hours drive from Downtown Portland. After being outfitted with wetsuits, splash jackets, neoprene booties, helmets and life jackets, guests will be driven to the put-in, where they will receive a safety talk and paddling instruction. From there on its all fun! The first stretch is non-stop class III whitewater, with the rapids in quick succession, climaxing in the thunderous (and optional!) Husum Falls, one of the tallest commercially rafted waterfalls in the nation at 13 feet. Finally the guests will get to relax a bit and enjoy the beautiful scenery of the lush forested river canyon, and marvel at the restoration of habitat on the river after the removal of Condit Dam, one of the largest dam removal projects in history.